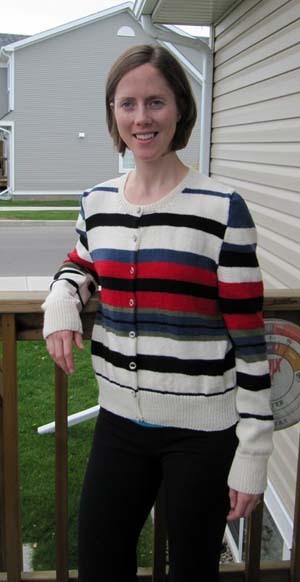 The Paul Smith cardigan is now finished and I can move onto my next sweater project, the Effortless Cardigan. My much more slender daughter, Jessica agreed to model the finished cardigan for me. It's too big on her as you can see, but she makes an excellent model. I haven't tried it on yet, but if the sleeves are too long, as they appear to be on her, then it's easy enough to fold them back. With 3 inches of ribbing on the cuffs it'll be fine. Buttons: I found some nice buttons at Gina Brown's in Calgary. They are made by "Hello Beautiful Buttons" by Jones-Chu Designs. As I'm writing this there are no buttons listed on her website. I'm not sure if they are porcelain or stone. I suspect that they are made of porcelain. (1) I loved this yarn and plan to use it again. I'll be making something in maroon, a color which is now, unfortunately, discontinued. (2) I followed most of the pattern as it was written, but I should have listened to my inner critic and changed the decreases at the neckline. The way the pattern had you do the shaping meant that there were large holes, which I carefully closed after the sweater was finished. I trusted the pattern since the rest of it was good. I should have trusted my instincts. I would make the top of the sleeves a bit less gathered as well. (3) The buttonholes, as written, are fine when worked on the ribbed sections. However, they didn't look tidy on the stocking stitch part of the sweater, so I made a change: I purled to the last 6 stitches, p2tog, yarn round needle, purl to the end. (4) There really aren't buttonhole and button bands but only a 2-stitch border on each side. This isn't enough to make the edges lie flat. I'm going to try to block the sweater again and keep my fingers crossed that the edges will be less curled under. (5) I don't normally like a 3-inch ribbing on my sweaters but I did it on this one, just to have more variety in my wardrobe. Update: I just tried on the sweater and the sleeves are much too long, but it looks okay with the cuffs turned up. I'm not fond of the bit of gathering on at the top of the sleeves, but I don't hate it. All in all, it's an acceptable cardigan and will get lots of wear. Wearing it, it feels very good. I don't think I'll be using this pattern again in the future, however, but I will use this yarn. Looks great -- good job and I bet you it looks very good on you too! 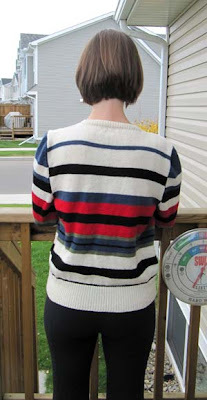 The sweater is beautiful as is the model!